Did you ever wonder how long it takes that most of the users of an older Delphi version switch to the newer one? Well, this question could be answered simply by looking at the sales figures of Embarcadero; however I doubt that Embarcadero will make the sales figures available to the public. An idea to get some insight to this question would be to exploit the search statistics of Google. These numbers are publicly available (at least the relative numbers) and certainly provide an indication of how many people are (still) working with a particular version of Delphi. So what I did, was to visit Google Trends, enter the following keywords, and download the data provided by Google. Search keywords: "Delphi 2009", "Delphi 2010", "Delphi XE", "Delphi XE2", and "Delphi XE3". The results clearly show that the decay of a particular search keyword immediately starts after the launch of a new release. The interest in the old release drops within a few months to half of the initial interest. 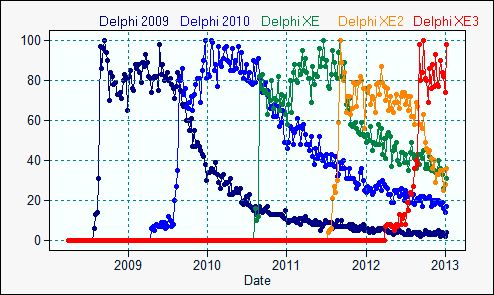 Only Delphi 2010 needed almost a year to drop to 50% - which may be an indication that the move to XE was judged excessively cautious by the users. I use Delphi 2009. But when I look online for information, I only use the keyword Delphi, not Delphi 2009. After all, why would I want to limit my results, when most information applies to most Delphi versions equally? But on the other hand: if you are looking for a solution which is specific to Delphi 2009, you would search for "Delphi 2009". My reasoning is: if there are less people using Delphi 2009 then there are less searches for this very keyword. Of course, including general Delphi searches would blur the data and this would not be useful at all. Interestingly enough the decay of the search counts strongly correlates with the sales of pre-compiled packages of the SDL Component Suite for a particular compiler. So it seems realistic to use the search counts as an indication of the users who are still using this particular release of Delphi.